Shroud (Small Metal) bolts on back side of blower housing to the block (crankcase) on Box Stock engines and other clone motors. Shroud (Large Metal) bolts under head on Box Stock engines and other clone motors. 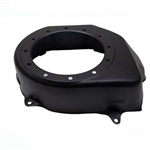 Blower Housing (NEW REINFORCED DOUBLE MOUNTING TAB) Stronger and more durable than before. No more broken tabs!